Abu Al-Abbas Al-Mursi Mosque - Who is Al-Mursi Abu Al-Abbas? This is considered the most important historical mosque in Alexandria. It is dedicated to Saint El-Mursi Abu El-Abbas who was a Sufi Saint in the 13thcentury in Alexandria& one of the four master saints in Egypt and that’s why the mosque is built over the tomb of that saint. It is located near the citadel of Qaitbay in the neighborhood of El-Anfoushi. Eugenio Valzania and Mario Rossi were the ones who redesigned and built the current form of the mosque. The mosque was constructed by the Algerians in 1775. 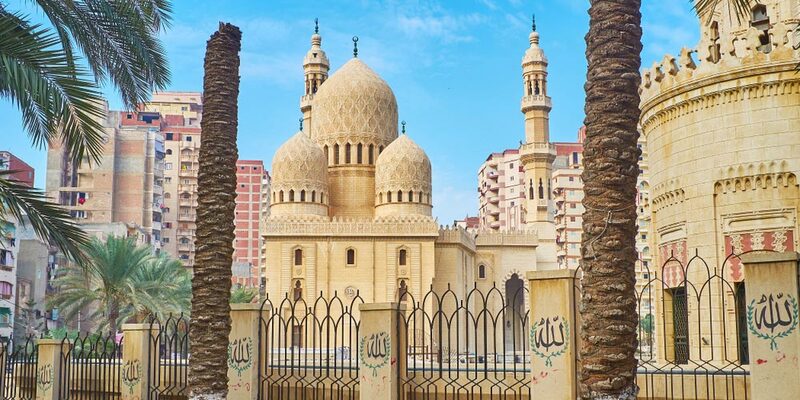 Today, Abu al-Abbas al-Mursi Mosque has became one of the most prominent landmarks of Alexandria, which tourists in Cairo don’t miss the chance to explore the beauty of this mosque through Cairo day tours. Who is Al-Mursi Abu Al-Abbas? His full name was Sheikh Shehab El Din Abu El Abbas Ahmed Ibn Umar Ibn Mohamed Al Ansary El Mursi. He was born in 616 in Andalusia. His family was wealthy and they were working in the trading business. He was well educated, having been instructed in the Quran, Sunna, and Sheha. He also grew up helping his father in his work and he was known for his many contributions and his honesty with everyone. He accompanied his family and left Spain because Christianity spread in the country on a wide range and they head to Tunisia. He met there El Sheikh Abu El Hassan El Shazly and accompanied him in his journey to Alexandria and became one of his best students. He even married El-Shazly’s daughter and he got two daughters & a son from her. Shehab Abu El Abbas lived for about 43 years in Alexandria as a Muslim teacher until he died in 686. El-Sheikh Zein El-Din Ibn El Qattan”the richest traders of Alexandria” visited the tomb in 1307 AD. He ordered his men to build a dome & a mausoleum for the tomb. 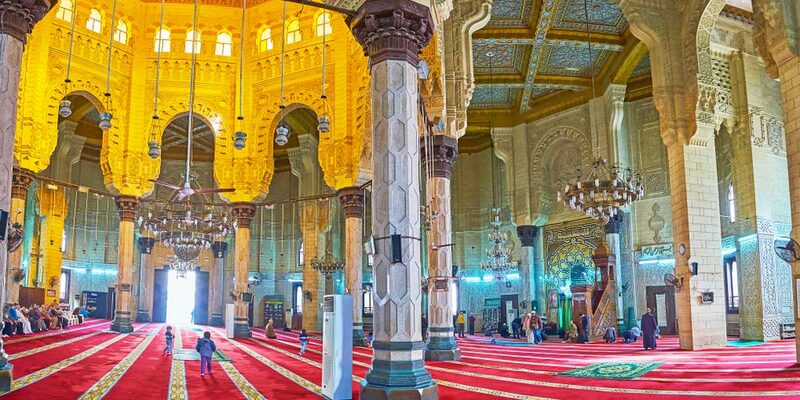 He also built a fine mosque with a small square minaret in addition to funding an Iman for the small mosque there you’ll find a tomb, which was placed under the dome to the right-hand side of the entrance. Abu Al-Abbas Al-Mursi mosque became a pilgrimage place for many Muslims from Egypt and Morocco who passes through Alexandria during their Hej journey to Mecca and from Mecca. Abu Al-Abbas Al-Mursi mosque was neglected in 1477 but when Gaqmas El Zahry, the ruler of Alexandria, visited it, he ordered that the mosque is renovated. He even ordered his men to build a tomb for him inside the mosque where he was buried after his death. After the visit of Sheikh Abu el Hassan El Maghraby to Abu Al-Abbas Al-Mursi Mosque in 1775, he ordered to build the current mosque of today. 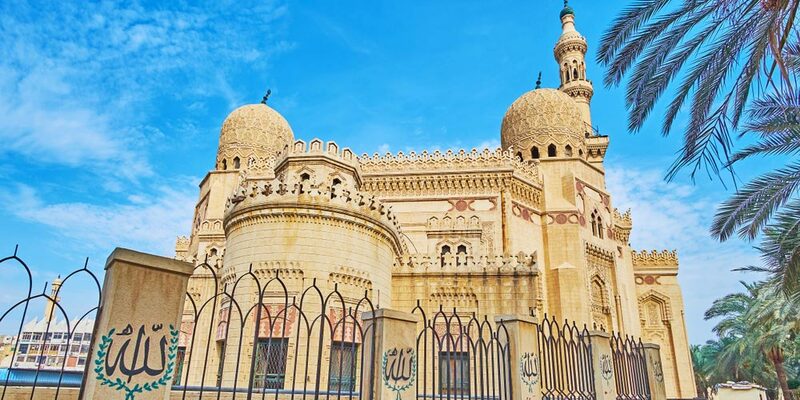 Ahmed El Kakhakhny, who was one of Alexandria’s most famous builders found out in 1863 that the mosque need many modifications and that’s why he renewed it. The governmental endowment for Islamic affairs “The Awqaf” is the one that operated the mosque. When King Farouq decided to make Alexandria “the Jewel of the Mediterranean Sea, he established a square, which was called “Square of the Mosque” and that El-Morsi Abu Al-Abbas wan the main center point of that square. The walls of Abu Al-Abbas Al-Mursi mosque stand for about 23 meters high and dressed in artificial stone. While the minaret, situated on the southern side, reaches about 73 meters. It has an Ayoubids design, with four sections. The first section is about 15 meters high and it has a square shape. The second section is four meters high and has eight sides. The third level of the mosque is about 15 high with sixteen sides. There is brass that covers the top of the Minaret and has an Islamic moon finale. There are two entrances of the mosque. The columns are solid including their capital and base. They have an octagonal shape, which measures 85 meters in diameter and 8.60 meters in height. There is an elevated skylight with eight sides in the center of the ceiling, which is known as known as a Shokhsheikha, that is 24 meters above floor level and 51 meters side. Each side of the skylight actually has three windows of colored glass in arabesque designs, set into aluminum frames and this one is surrounded by four domes, placed over the four mausoleums within the complex. There is an inner and outer layer for the domes. The inner dome that forms the ceiling stand 22 meters high and is 5 meters in diameter. The floors of the mosque are paved in white marble. The different parts of the mosque including its doors, minbar, and windows are made of carved teak, citron and walnut. The minbar is 6.35 meters high and has, verses of Quran written at the top in French gold. The mihrab of the mosque is located in the Qibla wall and stands at the base of the mosque’s minaret. At the end of each column, you can find the name of Mohamed in the Kufic style of Arabic writing. The main rule in Islam, There is no god except Allah and Mohamed is the prophet of Allah, is written twice, also flanking the mihrab. The construction of the mosque was completed in 1943 by the Ministry of Waqfs and it cost about 140,000 LE. This amazing construction remains one of the mesmerizing attractions in Alexandria that revives the memory of the most beloved saint of Alexandria. Finally, we care about your needs, so we are able to provide Egypt tour packages to anyone who wants to meditate & behold the beauty of Egypt.